Typically, whenever the subject of the early architects of rock ‘n’ roll arises, names like Howlin’ Wolf, Big Joe Turner, Hank Ballard, Bo Diddley and Big Mama Thornton are bandied about. But rarely is Etta James recognized among those pioneers. Indeed, when most people think of James, they focus on her post-1960 career, particularly her years at Chess Records where, beginning with the iconic “At Last,” label owner Leonard Chess transformed her from a gutsy blues shouter to a power balladeer. But as early as 1954, James was, under the guidance of Johnny Otis, pivotal among the artists erecting musical signposts for Elvis, Jerry Lee and others who would follow. James was inducted into the Rock ‘n’ Roll Hall of Fame a full eight years before her 2001 inclusion in the Blues Hall of Fame. And, in 2008, Rolling Stone ranked her at number 22 in its rock-focused list of the 100 Greatest Singers of All Time. Among the women on that list, only Aretha Franklin and Tina Turner ranked higher. Fortunately, the best of those early recordings, all for Modern Records, have now been assembled in a single-disc collection. 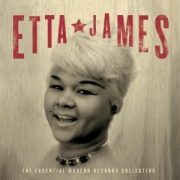 Etta James: The Essential Modern Records Collection (Virgin/EMI) includes 15 tracks spanning 1954-57. It opens with James’ rather notorious “Roll With Me Henry,” recorded when she was just 16. A raunchy answer song to Ballard’s equally suggestive “Work With Me Annie,” the track was considered too racy for mainstream radio airplay. The title was changed to the less evocative “The Wallflower” and, despite its notoriety (or, more likely, because of it), it soared to number 1 on the R&B charts. The track’s crossover potential was limited by more than just its sexually charged lyrics. Former Artie Shaw vocalist Georgia Gibbs, signed to the far more powerful Mercury label, released a cleaned-up cover version, safely entitled “Dance With Me Henry.” It spent three weeks at number one on the pop charts. James countered with a coy follow-up called “Hey! Henry” (also included on the disc), but it failed to make much noise. It was, instead, the wailing “Good Rockin’ Daddy,” co-written by Richard Berry (who can be heard singing counterpoint on “Roll With Me Henry”) and Joe Bihari (who, with his brother Jules, owned Modern Records) that earned James her second major hit. Thereafter (until the massive success of “At Last”) the hits stopped coming, though the quality of James work did not diminish an iota. Two other Berry tunes are included in this collection, the rollicking “Number One” (which cleverly references “Henry” as a bygone lover) and the stridently plaintive “I’m A Fool.” James herself co-authored both the playfully sensual “W-O-M-A-N” and the high-octane “Tough Lover,” easily the equal of any of Little Richard’s thundering hits. Also included are her near-orgiastic reading of Lieber and Stoller’s “Tears of Joy” and the sunny “Come What May,” which finds James is a slightly mellower groove, presaging her Chess work that commenced just a couple of years later. Perhaps most intriguing are, however, James’ explosive reinvention of the traditional ditty “Shortnin’ Bread” (a song that Brian Wilson would subsequently become obsessed with) and the colorful short story “The Pick Up,” with a coolly assured Etta swapping salty lines with a blistering sax.